Frozen Chocolate Banana Pops are for the kid in us all. It's hard to resist the sweet flavor of a frozen banana enrobed in a thin coating of shiny dark chocolate. Eat them plain or roll them in chopped nuts, toasted coconut, granola or even candied sprinkles. A perfect frozen treat on a hot summer's day. To make Frozen Chocolate Banana Pops you will need: ripe bananas that are still firm, some kind of stick or skewer (popsicle sticks, cookie or cake pop sticks, bamboo skewers, or even chopsticks) to insert into the bananas, good quality semi sweet or bittersweet chocolate, and a little flavorless oil (vegetable, canola, corn, safflower or a light olive oil) or even coconut oil. Chopped nuts, toasted coconut, candy sprinkles or chocolate jimmies are entirely optional. These are not difficult to make. The first step is to freeze the bananas for about 15-30 minutes before dipping them into the melted chocolate. But don't cover them with plastic wrap as we don't want moisture to form on the bananas as they freeze. We add a little flavorless oil to the melted chocolate because it lowers the chocolate's viscosity which prevents the chocolate from forming too thick of a coating on the banana. While you can eat the chocolate banana pops right away, the bananas will still be a little soft. So I like to place them in the freezer for at least 30 minutes before serving. Covered, they will keep in the freezer for about a week. If they have been stored in the freezer overnight, I find it best to put them in the refrigerator for at least 30 minutes before serving so the frozen banana softens a little. 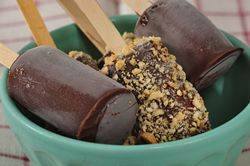 Frozen Chocolate Banana Pops: Line a baking sheet with parchment paper, wax paper, or aluminum foil. Cut the bananas into 2 - 3 inch (5 - 7 cm) chunks. Insert a cookie stick, popsicle stick, bamboo skewer, or a chopstick into the pieces of banana. Place on the baking sheet and freeze for about 15 - 30 minutes. Makes about 9 - 2 inch (5 cm) frozen chocolate banana pops. Preparation time 30 minutes. Note: To toast coconut, place in a 300 degree F (150 degrees C) oven and bake for about 5 minutes or until lightly browned. Watch carefully.